My favorite DIY tutorials that hit the blogopshere in the past week...coming...now! 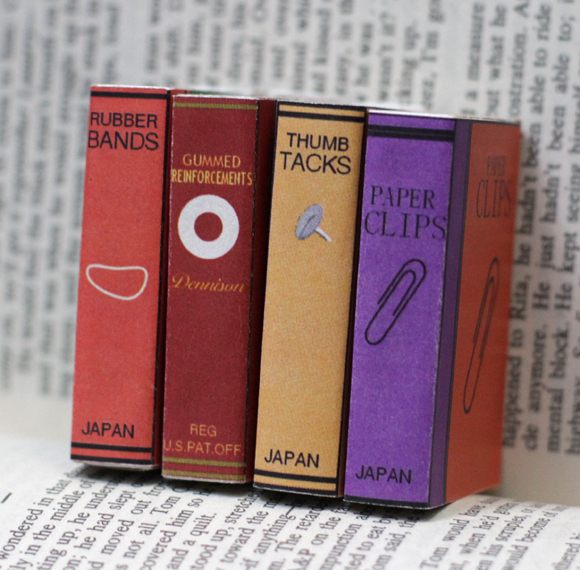 This has to be the cutest way to store office supplies that I've seen in a while. I came across these via Heather at Dollar Store Crafts, who was kind enough to provide the printable covers in case you want to make your own! Keeping in a similar page (ha), the DIY Maven showed us this week how to cover books in canvas, which I love for its clean and simple look. 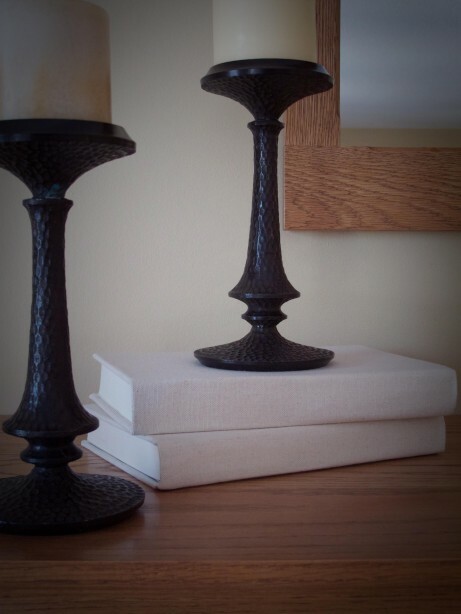 And, it's a great way to give new life to old books you often find at thrift stores. Maybe even take it a step further if it's a book you like to read, and stitch the title on the spine before gluing the canvas down?! 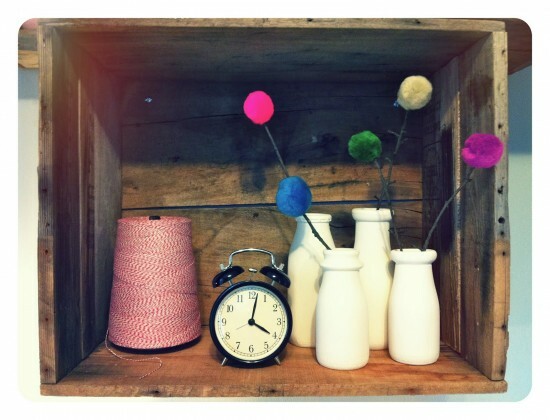 I love these faux porcelain milk bottles (plus a pom pom tutorial) via papernstitch. I've seen lots of these popping up in stores like West Elm (which the closest location to me is now Chicago, dang it! ), but these are so inexpensive and easy to make, you won't really miss the fact that they're glass and not porcelain. Plus this tutorial is actually a video, which I love. It's so much easier to see the directions instead of read them. If you tuned into last week's DIY Friday, I'm sure you'll remember my favorite one in the bunch (you can see it peeking on the right side of the photo). 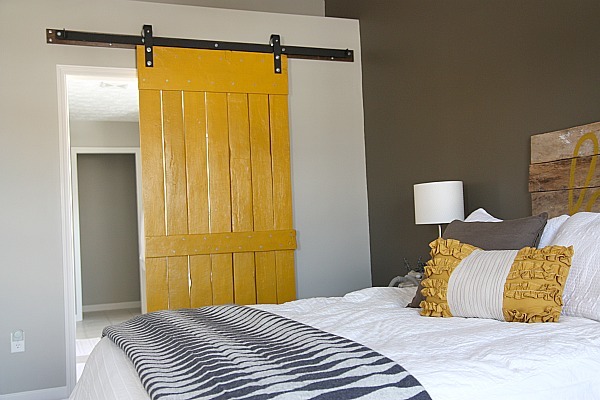 This week Poppytalk shared Dana's DIY Sliding Barn Door, something I've always wanted to install in my home. And I love the mustard color she chose! 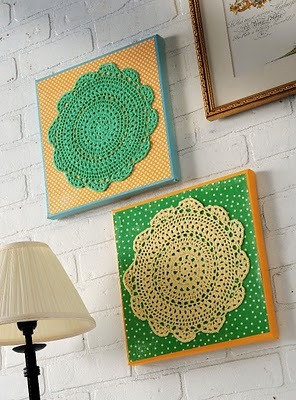 Lastly, Amy over at Mod Podge Rocks, one of my new favorite blogs, came up with this funky wall art made with colorful doilies she scored in the dollar bin at Michael's. Perhaps I'll make a trip to my local store this afternoon...hmmm. Hope you're inspired to tackle some DIY projects this weekend!